In Italy, the local sign language for deaf people isn't legally recognised. But the well-known, expressive hand gestures have their own dictionary and wider appeal, to the frustration of deaf people. There are many things we associate with Italian culture - espresso coffee, scooters, gelato, expensive designer clothing. But perhaps more central to the Italian character is the way they use their hands to animate their speech. Whether rubbing thumb and forefinger to signify money, flicking the chin to show how little you care, or even tapping underneath the eye with an index finger to show agreement, gesture is widely used and understood. Prof Isabella Poggi at Roma Tre University recently formally categorised around 250 gestures in a detailed research paper that also explored the use of rhetoric, irony and context. She told See Hear, the BBC's programme for the deaf community, that gestures may be more important in Italian culture than in any other. "We inherited the language of gestures from the Greeks," she says. "When the Greeks moved to southern Italy and colonised Naples, the Italians used gestures as a way to communicate without being overheard [but] the gestures continued to have a tradition as a way of communicating." Sicilian film-maker Luca Vullo has documented Sicilian gesture - an even more free-spirited and expressive variant of that found on the Italian mainland - in a humorous documentary La Voce del Corpo, (The Voice of the Body). He is emphatic that gesture is a special part of everyday life in Italy. "When you are in Italy, you need to go on the street, in the markets, in the square and just watch the faces, the hands and the body of the people," says Vullo. "I think the Italian people are more physical but because it is in our blood." The earliest collection of gestures, called The Ancients' Mimic Through The Neapolitan Gestures, was published in 1832 in Naples by Canon Andrea de Jorio. It is included in a dictionary of gestures published in 1958. There are also numerous online glossaries and videos. Forefingers, palm facing down, flicked from under the chin forwards, meaning "I don't care"
Make a "beak" with your thumb and forefingers pointing up, hand moving up and down, meaning "What/where/why?" Fold your arms and tap your left elbow with the palm of your hand to indicate that someone is "stingy"
Place your palm on your heart, meaning gratitude or "thank you"
Hit the inside edge of your hand against the palm of your other hand, meaning "get out of here" or "let's get out of here"
The work of Poggi and Vullo have received worldwide attention, but this has left some in the deaf community asking where they fit in. Italian Sign Language, known as Lingua Dei Segni Italiana - or LIS - is used by thousands of deaf people and is a richer and deeper visual language than gesture, according to Barbara Pennacchi, a deaf research assistant and linguist. She says gesture is more of an enhancement to everyday speech rather than a language in its own right. There are some similarities, though. 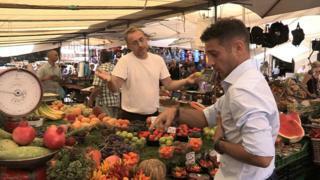 Deaf See Hear presenter Memnos Costi found it surprisingly easy to order a few basic items in an Italian street market using simple gestures he'd picked up (see video). He described the market culture and communication as marvellous and said he wouldn't have bought anything if he'd had to resort to using a pen and paper. "I'd just walk off and go to the supermarket," he said. "England is different," says the presenter. "People don't tend to use facial expressions, and it's difficult." Britons may not use helpful gestures as widely, but the local sign language, BSL (British Sign Language) does have a high status. It was given official recognition in March 2003, which has led to more rights for deaf signers under the Equality Act and the Disability Discrimination Act. Provision of interpreters has grown as a result. In contrast, in 2011 the global deaf community erupted in protests at the Italian government's attempts to downgrade LIS to Linguaggio Mimico Gestuale (LMG), essentially a language of mime and gesture, which, it was feared, would diminish the rights of deaf sign language users. Since then, changes in government mean the plans have been dropped for now. Tiziana Gulli, who is deaf and from Rome, explains the wider situation: "Twelve minority languages have been given official status, but LIS has been ignored. It's important this goes on the list as a language," she says. "It means access to communication and information. It means we can access life, work, school, university, medical access and other elements. It means we can fully participate in life and in society." You can find out more in our Italy Special on See Hear, on Wednesday, 26 March at 10.30 GMT on BBC Two.